Let the "Hate Shaq Tour" continue, as ESPN.com so kindly puts it. Tuesday night, after the Orlando Magic put down the Phoneix Suns 111-99, Magic head coach and former head coach of one Shaquille O'Neal, Stan Van Gundy, slammed Shaq for his play that night. His play included, flopping on Dwight Howard rather than moving his feet to play defense, racking up his usual four fouls a night, and pulling down the same amount of boards as Magic power forward, Rashard Lewis, whose three inches shorter. Stan Van Gundy recalled listening to Shaq constantly complain to refs how big men defending his 320 pound frame, "flop," and in turn put O'Neal into subsequent constant foul trouble. Van Gundy was amazed that the guy he coached would then turn and do the same thing he despised to the quicker, younger, more athletic version of Shaq, Dwight Howard, who was busy tooling on him. Stan Van Gundy may look like a New York City pizza shop owner, but he's pretty accurate. Shaq believed he was built for Los Angeles, which he was, that isn't the arguement. 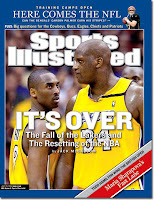 However, being the older, wiser, veteran hoops player, you think Shaq could have backed down and allowed Kobe to be Kobe Bryant, at least two more championships could have happened. But of course, Shaq believes he is the greatest thing since sliced bread, even though he's rarely in shape and still can't hit free throws after 16 years in the league. Why is it that Phil Jackson didn't try to follow Shaq to his next destination? Why is it that no other play is sticking up for Shaq? Because he's a child, and not the type of child who just likes to have fun, the type of child who can't stand it when someone gets more attention than him. Five years after leaving Hollywood and putting the feud to bed, Shaquille O'Neal is found in a night club attempting to rap one of the most pathetic raps about his former teammate. Hey Shaq, your overrated and outdated, tell me how my a** tastes. Kobe has his own faults, granted, but really Shaq? You can't let sleeping dogs lie and move on with your life? If you think I'm buying that all-star game reunion, please. The co-MVP was more contrived by the NBA than anything I've ever seen, and this is the NBA, come on. Miami? From presenting himself to Miami during the MTV music or movie awards, whatever it was, Shaq's entire time in Miami was fraudulent and can be defined by two words: Dwyane Wade. Dwyane Wade is hands down a top five player in this league for the next 6 years, easily. 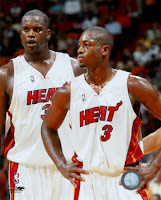 More importantly, during the championship year of 2006, Wade was phenominal and with an assist from the refs, led the Heat to a championship season. NOT SHAQUILLE O'NEAL. It's my contention that Shaquille O'Neal, in the Eastern Conference, with Duncan and Yao playing in the West, should be WAY more than a 20 and 10 guy, especially when he claims he's the MDE (Most Dominant Ever). However, he's not and to prove it, look at his stats, he hasn't averaged more than 11 rebounds a game since the 2000-2001 season, he's 7-1, 320 pounds! Yes, he's got rings, but so does Robert Horry, and it's time we start recognizing Shaq for what he was . . but I digress. Dwyane Wade couldn't stay healthy each of the last couple years since the championship season, Shaq has a clock ticking on his career, due to the fact that he never loses weight or improves his game from season to season, he forces the Heat's hand and ends up in Phoenix, I'm sure some people in Miami weren't upset about that. Now he's in Phoenix, and the Suns aren't as good as he advertised. I can be a Monday morning quarterback on this one, I liked Shaq to the Suns, because I didn't think they'd be able to get past the Spurs or Lakers without a big man, turns out he was the wrong type of big man. Slow. He never tought Amare what we thought he would teach Amare, he never dropped weight and ran the floor, and even worse, he has startd to "flop," he's 320 pounds, you don't flop at 320 pounds. He's now down to averaging 18 points and 9 boards a night, and for a guy who once pulled down 13 boards and scored 30 points a night, he's finished. To make it worse, he's now trying to turn back the clock and warm up to his former L.A. pals, HEY SHAQ, they are going to win one without you, and you won't be coming back. You think Steve Nash hasn't aged a few years since he started playing with Shaq? You think Steve Kerr would do that trade again? Please. So somehow, after all that has happened in Shaq's career, he's going to call out Stan Van Gundy and say "Now I see why everybody who plays for him doesn't like him." If you weren't as intimidating as I'm sure you are, I think Kobe, Dwyane Wade, and Steve Nash, three of the games most respected athletes, would have some things similar to say about you. Since they haven't said it, I will. Shaquille O'Neal is a monster disappointment in NBA history, and I think you need recognize that. Due to his size, the players he's played with, and the period of time he played in, he should be largely more successful than a string of championships with the games best coach and one of the games best talents, oh and that little stint with Flash in Miami. You want to comment on front runners? You are a frontrunner Shaq, the worst kind of front runner. For years I've been amazed that you can't manage to hit a free throw with any form of consistency from year to year. You've played in a time that can arguably said has had the least amount of competitive centers. Oh, how did I forget this. EVERY MOVE YOU MAKE ON THE OFFENSIVE END COULD BE AN OFFENSIVE FOUL. Not many players have made a career of lowering their shoulder and plowing through the defense, that is for fullbacks, your a center. Now Stan Van is irrepressible because he suggests that your resorting to flopping in an attempt to not have to play defense? I've had it with Shaq, about as much as I'd had it with Brett Favre last summer, and that took some time. Just shut up and play basketball, do us all a favor.